They Said Keep It Simple, So Why Isn’t It? 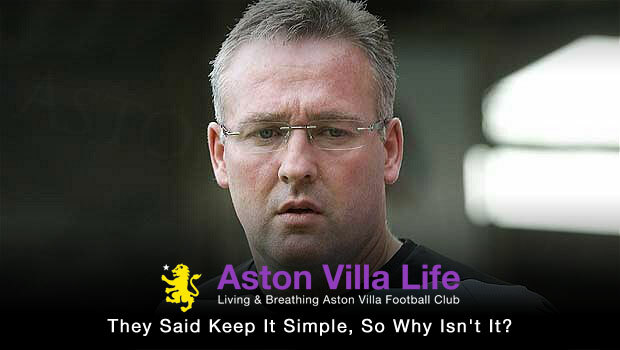 AVFC | Aston Villa Life - An Aston Villa Blog and Mobile Site for iOS and Android > Aston Villa Blog > Columns > Talk Tactics > They Said Keep It Simple, So Why Isn’t It? So another season has started and already the divisions have started. Some have cast their verdicts without all the evidence being shown and it would seem that many Villans have selected their villain of the piece, have lines up the firing squad, and a another person ready to give someone the bullet – the bullet of blame for Villa’s current position. People used to say football was a simple game in the past, and it was. But then came the offside rule. Nowadays, off the pitch, the twists and turns of any football club makes the offside rule look like child’s play in today’s game. The reason for the position Villa find themselves in is a complex one, and no single one person is to blame. Don’t get me wrong, there is blame to be dished out, but there are also events outside the control of the club that have also had detrimental effects – don’t underestimate the damage the emergence of Manchester City did to Villa. Looking back at the time before City arose, and Spurs fans reading this won’t like it, but Villa were more of a danger to the top four when the “Crude Cash” came flowing. During that season, it was Villa that spent the best part of the season in the top four, and even third was looking possible. Back then, it was Villa that where ruffling the feathers of the top four. Spurs where on our heels, but they never threatened those top four places until Manchester City decided to attack our own squad’s core. Heads were turned, and so the “selling club” tag was created – and from that point no player was safe at our club. Some will blame Lerner for not keeping them, but the point is that these players wanted to go for more success, and no amount of money would have kept them. The only other option we has was to have held them to the end of their contracts, potentially with them being disruptive, and then lost them on free transfers – leaving us with even less money to reinvest. So, whilst’s it is very easy for us as fans to say that “We should have signed so and so” or “I don’t understand why we have sold them to another club”, the reality is that Villa struggle because they haven’t been hugely been able to break through in recent years, despite trying to spend their way to that achievement with the closest we came was a cup final in 2010 – was that worth it for all the money? Instead, we’re left to wonder what could have been. Is it a bleak future? No, but it may well upset people to see the damage done to our team after coming so close. Can we get there again? I think we can, though it may well take more time and patience than some want to invest. This entry was published on September 19, 2013 / Graham O'Gara. Posted in Aston Villa Blog, Columns, Talk Tactics. Bookmark the permalink. Aston Villa could have got top four but never managed it. In the embers of the aftermath, Graham O'Gara asks if there is any way back. Could A Perfect 10 Solve All Villa's Issues? As Aston Villa suffer at the hands of the second attacking midfielder in as many games, Josh Cattier looks at what the club might gain from a skilful number 10.